"The opening of the seven seals shows us that every person who claims to believe in Christ will receive blessings for faithfulness or curses for unfaithfulness." Hello, friends, welcome again to Sabbath School Study Hour here at the Granite Bay Seventh-day Adventist Church in Sacramento, California. I'd like to welcome those joining us across the country and around the world on the various social media outlets as well as our online members, who are tuning faithfully every week to study the lesson with us. I'd also like to welcome our regular church members as well as those who are visiting with us today. Thank you for being here. We have such an important lesson that we're going to be looking at, one of my favorite passages in the Book of Revelation, it's Revelation Chapter 7, talking about those who have the seal of God in their foreheads. Well, that's a good lead into our subject for this entire quarter, it's on the Book of Revelation. Those of you have been attending, you know, we've been studying through our lesson quarterly. Today we find ourselves on lesson number six, and it's in entitled "The Sealed People of God," really the core of our study is from Revelation Chapter 7. Pastor Doug is going to be sharing some very important information about that here in just a few moments. But before we get started on our lesson, I'd like to remind our friends who are joining us of our free offer today. We have a book entitled "Who Will Sing the Song? 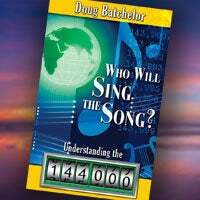 Understanding the 144,000," a book written by Pastor Doug, and this is our free offer. To anyone who are watching, if you'd like to receive a copy of this book, the number to call is 866-788-3966, and you can ask for offer number 172, 1-7-2 or if you'd like, you can receive this book in a digital form by texting the following code, "SH119" to the number 40544. You will then receive a link as to where you can download the book, Who Will Sing the Song? And I think you'll find it a very interesting study, and indeed it does go along with our study today. Well, before we get to our lesson study, let's bow our heads for a word of prayer. Dear Father, once again we are grateful that we're able to gather together and study this very important book and very important topic we find in the last book of the Bible. Father, the most important question that anyone can ask is, "How can I have the seal of God? How can I can be amongst those who are found ready when Jesus comes?" So we do pray that Your Holy Spirit will guide our hearts, our minds as we study together. In Jesus' name, amen. Amen. Our lesson today is going to be brought to us by Pastor Doug. Good morning. Hey, Jëan, you want to teach the lesson with me? What were you going to do, you gonna sit down? This is his favorite subject. You want to grab a Bible. If you want to teach, get a Bible, let's do it together. He didn't knew I was going that, isn't that mean? I just know one of his favorite subjects is Revelation, and we never know how the stars are going to line up with who's going to teach what dates, it has to do with travel, and I know that he's just kind of thinking, "Oh, man, I want to help teach this lesson." Okay, let's do it together, let's see what happens. We may never do this again. We'll try it out. Welcome everybody to Sabbath School Study Hour, and our lesson today is lesson number 6. Now, I know this sounds confusing, it's lesson 6 on Chapter 7 of Revelation. And so God willing, we're going to try to cover all of Revelation Chapter 7 today. Now I need help because this is 144,000, the seal of God, and the great multitude, and the song of Moses, very important material in this one lesson. Now we've got a memory verse, and the memory verse comes from Revelation 14:7, and this is from the New King James Version. I hope you'll say this with me, you're ready? "These are the ones who come out of a great tribulation, and washed their robes, and made them white in the blood of the lamb." Now, you know, what I thought I do as we try to teach this lesson is why don't we go ahead, you look at Revelation 14, why don't you read up until the great multitude in Revelation 7 verse... I'm sorry, Revelation 7:1. Absolutely, I'll be happy to. All right, Pastor Doug, here we go. As I've said, we haven't rehearsed this, so we don't know what's going to happen, neither do you, but we're happy to talk about one of our favorite parts of the Bible. So Revelation Chapter 7, I hope you have your Bibles with you, going to spend a lot of time right in this passage. And let me read the first part of Chapter 7 dealing with 144,000, and that goes all the way through to about verse 9. So I'm gonna start in verse 1, it says, "After these things I saw four angels standing on the four corners of the earth, holding the four winds of the earth, that the wind should not blow on the earth, on the sea, or on any tree. Then I saw another angel ascending from the east, having the seal of the living God. And he cried with a loud voice to the four angels to whom it was granted to harm the earth and the sea, saying, 'Do not harm the earth, the sea, or the trees till we have sealed the servants of God on their foreheads.' And I heard the number of those who were sealed. One hundred and forty-four thousand of all the tribes of the children of Israel, they were sealed.'" Maybe we should stop here. I just look it all, we've got in there, and probably out to do a little expository teaching right here at this point. All right, first of all, we studied the seven seals last week, but we only got to six. So we haven't got to the seventh seal yet. Before the seventh seal is opened, you've got Chapter 7, Chapter 8, you actually have the opening of the seventh seal. So when he says after these things, after what things? After this, the sixth seal. So we know when in history this is happening, down near the end of time, there's a sealing that takes place before the seventh seal is opened. And when the seventh seal is open, all kinds of things break loose, and it's a sign of the second coming. Now when it says these four angels at the four corners of the earth, what does that represent? Well, you're talking about four. In the Bible, you know, the numbers have prophetic significance. Some people wonder, he's just talking about the earth being flat, it's like a square, and there's four corners, and there's an angel assigned to each corner holding the corner of the earth. No, it simply means the four points of the compass, north, south, east and west. So when it talks about the four angels holding the four corners of the earth or standing at the four corners of the earth, it's really just describing these angels holding back these winds of fury from the north, south, east, and west. So God is still holding back this full wind of strife that is about to come until the sealing occurs amongst God's people. It's a storm that... By the way, there's another verse if you ever want to understand Revelation, compare scripture with scripture. Matthew 24, when Jesus talks about His coming, "He will send His angels with the sound of a trumpet, and they will gather together his elect from the four winds." You find both winds, angels, and four in the seals we're studying right now. From the four winds of heaven, from one end of heaven to the other. It's just talking about from around the world, they'll be gathered. Now it says that there's not supposed to... They're not to release the winds to blow upon earth, tree, water. Sounds like name of a rock group. But there it's talking about the environment, nations were trees. What is water represent in Revelation? Multitudes and nations, kindred some times. Pastor Doug, can I add one point here. Yeah, please, why... I want you to. Just to kind of give the setting here. Pastor Doug mentioned that Revelation Chapter 7 is in the midst of the sixth and the seventh seal, but there is an important question that's asked in the sixth seal that leads into the 144,000. And you find in Revelation Chapter 6, just to back up a little bit, just to give the context, verse 15 says, "And the kings of the earth, and the great men, the rich men, the commanders, the mighty men, every slave, every free man, hid themselves in the caves and in the rocks of the mountains, and they said to the mountains and the rocks, 'Fall on us and hide us from the face of Him who sits upon the throne and from the wrath of the Lamb! For the great day of His wrath has come, and who shall able to stand?'" So the sixth seal brings you right up to the second coming of Jesus. But a question is asked, the question is, the day of His wrath has come, talking about the second coming of Jesus. The question is, who's going to be able to stand when Jesus comes? And then John hits the pause button, backs up just a little bit to talk about a group of people that are able to stand when Jesus comes, and he gives a characteristic of this group of people and says, "Oh, they have the seal of God in their foreheads." Amen. And then on the next seal, the eighth seal, you actually have the second coming of Christ. So this is kind of an important connection, Chapter 8. I mean Chapter 8, seventh seal. Yeah. So then we're... Now let's talk for a second about what is the seal of God. And if you look in Isaiah 8:16, he says, "Bind up the testimony, seal the law among My disciples." So somewhere in the law of God, you find the seal of God. Now I always like to take people on just the visual of this for a second. If I were to say, we went on a trip to the Holy Land this year, where did we go? Israel. And then if I tell you while we were in the Holy Land, we went to the holy mount, where's that? Temple Mount, Mount of Olives, it's actually Mount Moriah, which is the Temple Mount, Mount Zion, it's sometimes called. And on the Temple Mount, you've got the holy city. What city am I talking about? Jerusalem. And in the holy city, you've got the holy temple. And in the holy temple, you've got the holy place. And just beyond the holy place, you have what? The Holy of Holies, and the most holy place. Now notice how often the word holy appears here. In the Holy Land, you get the holy city, you get the holy mount, you get the holy temple, you get the holy place, get the Holy of Holies, and in the Holy of Holies is the holy ark, and in the holy ark is the holy law, and in the holy law, you find the word holy one time. Do you know where? Fourth Commandment, isn't that interesting? And God's purpose, the plan of salvation is to make us holy. And so the seal of God is in the middle of His law. It's the only commandment where you find the word holy, and it's something else. What are the characteristics of a seal? Well, seal, if it's going to have any value, it has to have the name of whoever has the authority of that seal, so often it would have the name of the king, it would have the territory that the king governs, it'll also then have some kind of title connected with the king. Well, you might say the king, the monarch of whatever place it might be, gives the territory, and it gives his title. So dominion, who it is, and title of three characteristics that you depict defining the seal. When Darius put his seal on the stone when Daniel was put in the lion's den, that seal said, Darius, that's his name, King, it's his title, Medo-Persia, territory. When Pilate put a seal on the tomb of Jesus, it said Pontius Pilate, it's his name, governor, Judea. And so, where in the law of God do we find the seal of God? You know, what part of the fourth commandment? Where it says, "For in six days, the Lord," Jehovah, it's His name, "created," that's His office, He is the creator and sustainer of all things, "of the heaven and the earth," His territory. So in the middle of the law of God, you find the words holy, and you find the seal of God, the components of a seal. And the Sabbath is really different because all the other commandments, it says, "Don't worship other gods, and don't take the name of the Lord God." But it's not until you get to the Sabbath, it describes who this God is. The Sabbath Commandment. Now, of course, the Sabbath being an outward sign of the seal, it's more than just a day, although the day is very important, especially at the end of time. But like any of the Ten Commandments, it has to do something with the heart, you know, the new covenant promise that God makes with those who believe in Him, that He'll write His law on their hearts and in their minds. So to have the seal of God is more than just an output observance of a particular day, but it is to have that law of the creator written in our hearts and our minds. It has to do something with our character, with our belief, with our faith. Amen. Now, in just a moment, I'm going to let someone read a verse. Hoftis, I think you'll have this next one talking a little bit about this seal. First of all, when you think about something in the forehead or in the hand in Revelation, do you think of something good or bad? Lot of people, if I say you're going to get something before the end of the world, someone's going to offer you a mark in your forehead, do you want it? And people say, no. But all the same type of mark in their forehead. Everybody's marked in the forehead or the hand in Revelation. There's a good mark you read about in Ezekiel 9. If you read this vision in Ezekiel 9, only those who received the mark from this angel live through the terrible judgment that goes through the land. And so everybody wants that mark. Keep in mind also, the mark of the beast talks about the hand or the forehead. If you look in Deuteronomy when the Ten Commandments are given, Deuteronomy Chapter 5, then go to Chapter 6 where God says, "Hear, O Israel, the Lord our God is one, thou shall love the Lord with all your heart, mind, soul, and strength." And He says, "These words, I command you to stay." That's the Ten Commandments, shall be in your heart. Clearly is symbol, right? Teach them to your children diligently, put them on the doorpost of your house. Then He says, "Bind them for a sign on your hand, put them as front what's between your eyes that the Lord's law may be in your heart." And so it says, if basically, if you don't have the law of the Lord in your heart, and your hand, and your head, that means your actions, your thoughts, your affections, you'll have the mark of the beast in the last days. You either have one or the other. If you're not with Him, you're against Him. Is the Sabbath a sign? Go ahead, read for us, please. I think it's Ezekiel 20:20. Ezekiel 20:20, "Hallow My Sabbaths, and they will be a sign between Me and you, that you may know that I am the Lord your God." I'm going to read a companion verse, it's a verse 12 of the same Chapter, Chapter 20 of Ezekiel. "Moreover, I gave them My Sabbath to be a sign between Me and them." The word sign, insignia, seal are interchangeable in the Bible. And so it says, the Sabbath is a sign, it's a seal. And so it shows what God you worship and why you worship Him, because He's a creator. So go ahead. Something else related to the mark and the seal, of course, as Pastor Doug mentioned in the Book of Revelation at the end of time, everybody alive on the earth, when Jesus comes, will be marked. They'll either have the seal of God or they will have the mark of the beast. And, of course, in Ezekiel 9, that seal is also referred to as a mark that is placed in the forehead, so it can be used interchangeably. Something else interesting about the word mark in the original Greek, it comes from the word kharakter, we get the English word character from the word kharakter. So it's kind of interesting that the seal or this mark at the end of time has something to do with the character, has something to do with the heart because the new covenant promises to write God's law in the heart. Whereas those that have the mark of the beast, they have just the opposite of God's law in their heart, they have the law of the beast power. So the two groups are bought to view in the last days. of the tribe of Gad twelve thousand were sealed," Asher, Naphtali, Manasseh, Simeon, Levi, Issachar, Zebulun, Joseph, Benjamin, 12,000 were sealed, right? I don't want to be redundant. You know, some tribe's missing. We still got 12 here, but how do we have 12 and you've got a couple that are missing. What's missing? Ephraim is not here, and Dan is not here. That doesn't sound nice that they would be left out of 144,000. Are these literal Israelites? We don't think so for a number of reasons. One is if you read your Bible back in the days on Hezekiah, the 10 northern tribes were conquered by the Assyrians, they were scattered through Assyria, a lot of them intermarried, some came back and later were known as Samaritans, sort of a hybrid, Assyrian Jews, and it's very difficult for you to find anybody that has got all the DNA of Issachar, Simeon, Zebulun in the world today. They've been intermarried, and dispersed all around the Far East. So we really doubt that it's talking about literally 12,000 from these tribes. When Jesus picked the 12 apostles, did He pick one from each tribe? No, most of the 12 apostles were from either Benjamin, Judah, or Levi. You got Matthew, what was his middle name? Matthew Levi, probably from Levi. Saul says, I'm from the tribe of Benjamin. And Judas Iscariot, probably from the tribe of Judah, and most of them were probably from the tribe of Judah because that's who lived in the southern kingdom. And so it's not talking about literal Jews when it talks about the 144,000. I got more, but I'll let you jump in. Yeah, you might be wondering, well, if we have two of the tribes taken out of the 12, which is Dan and Ephraim, how do we end up with 12 tribes? Well, you remember that Joseph didn't inherit a territory of land under the name of Joseph, but Joseph's territory was actually divided up amongst his two sons. So he had more territory. But in the list given here in Revelation Chapter 7, you'll notice that Joseph is mentioned and his sons, and then you have Levi that's added, that makes up your 12. Levi didn't inherit a territory when Israel occupied the Promised Land, they were dispersed amongst the other tribes. So there's great significance to the order of the names and the names chosen that make up this list that we have in Revelation 7. Now one theory about why Ephraim and Dan is left out is Ephraim was basically... That's the name that was used for all the 10 tribes in the north, often referred to as Ephraim because it was the biggest tribe. Southern kingdom is usually referred to as Judah, that's where we get the word Jew, it was the biggest tribe. The Bible says, "Ephraim is joined to her idols. Let her alone." Ephraim had turned to idolatry, that's why they were carried off. They never were allowed to freely return like the children of Judah came back from Babylon. And Dan, the word Dan means judge. It talks about Dan is a viper in the way. And so those two names, the symbolism of those two names had to be left out of the redeemed because of what they meant. But when you put all the names together, it says something. Would you like me to read it to you real quick? And this is in the free book that we're making available, who are the 144,000? Now, if you want to know what the names mean, you don't have to just have a special Bible name dictionary. In the Bible it tells you, when Rachel and Leah are having the 12 boys, them and their handmaids, every time a boy is born, they make a statement based on what their names mean if they tell you. If you take the statements that define the names that are given, the way they appear in Revelation Chapter 7, it tells the story of salvation. Now one thing I want you to also know, there is no other list of the 12 tribes in the order that you find in Revelation Chapter 7, which also makes you suspect it's telling us something. Every other... Why is Judah first? Reuben was the firstborn. It's a mixed up list. So here's what it says when you just line them up. If you were to say the names in Hebrew and the definitions, what is it saying? "Now I will praise the Lord." The word Judah means praise the Lord. "I will praise the Lord, for the Lord has looked on my affliction, and granted me good fortune. I am happy because with my great wrestling I have wrestled and prevailed. Thus God has made me forget all of my toil because the Lord has heard that I am not loved. He has joined or married to me. God has given me my compensation, my hire by dwelling with me, and the Lord will add to me the son of his right hand." It's a beautiful soliloquy of the plan of salvation, and the wrestlings and deliverance of the church in the names of the 144,000. It's very interesting when you look at the meaning of those names that describes God's people going through a time of wrestling, God will hear their cry, He will deliver them, He will prepare for them a dwelling place, He will add the son of His right hand. It's really describing not only the experience of the church, but in a special sense, it's describing the experience of God's people in the last days. Do God's people go through a time of wrestling before Jesus comes, where their faith is tested and tried? Yes. Sometimes refers to that as Jacob's time of trouble. Does God hear their prayer? Yes. Does He come to their deliverance? Yes, Jesus comes the second time. Is Jesus preparing a dwelling place for them in His Father's house? Yes, John Chapter 14 tells us that. So when you look at the meaning of the names, there's so many wonderful lessons describing the experience of God's people. Amen. All right, now here's a question everyone wants to know, 144,000 special group in the last days after the time of the sixth seal, is it a literal number? Well, what I say now, I say by permission, and not by commandment. I'm inclined to think it is. I might be in the minority, I might be wrong. It's happened once before. But let me tell you my reasons, okay? Remember, we don't want to fight about 144,000. After the 144,000 are named, it says then there's a group that cannot be numbered. There's no specific number, it's imprecise, a great multitude, but it gives a precise number for the 144,000. Are other numbers in Revelation, do they have real value? Does the New Jerusalem really have 12 gates or is that symbolic? Does it really have 12 foundations? Most people I read, they believe it. Are there really 12 kinds of fruit 12 times a year? I never have anyone hear argue with that. When they talk about the dimensions of the New Jerusalem, 12,000 furlongs or 1500 miles around. All the evangelist I know, say, "Those are literal, the dimensions." And so when it talks about the 10 heads, or the 10 crowns and the 7 heads. Do we really count that number of heads and crowns? And they have a meaning, the numbers have a value? Yes, so I think we got to be careful about the sweeping aside the number. Let me give you something else to think about. Why did Jesus pick 12 apostles? Couldn't He have picked 9, 14, why, after Judas committed suicide, you read Acts Chapter 1, before the Holy Spirit was poured out. It says, "They entered into the upper room…" I'm in Acts 1:13, someone's going to read for me Acts 1:17 in just a minute. "They entered into the upper room where they were staying," Peter, James, John, notice here, "Peter, James, John, Andrew, Philip, Thomas, Bartholomew, Matthew, James, the son of Alphaeus, Simon the Zealot, Judas, the son of James. I just counted 11. It specifically says there's 120 in the upper room, but it names 11 apostles, and there's something obviously missing. Peter stands up and says, "Judas died according to the prophecies." The prophecy said, "Let someone else take his Bishop prick," his office. They cast lots. And why don't you go ahead and read Acts 1:17? Acts 1:17, "For he was numbered with us and obtained a part in this ministry." Judas had been numbered with them, there was a number, he picked 12. So they cast lots, it says in verse 26, "The lot fell on Matthias. He was numbered with the eleven," equaling the number, what? Twelve. What happens in the next verse after they replace Judas? There's a mighty shaking when the Holy Spirit is poured out. Do we believe that there's going to be a special outpouring of the Holy Spirit in the last days in connection with 144,000? Yeah, I don't believe 144,000 are the only ones saved. You know what? If you got about 8 billion people in the world today, and only 144,000 are saved, your chances of being saved are approximately 1 out of 55,000. So it would be pretty remote for any of you here, statistically speaking. So I don't think they will be only one saved. I think the 144,000 is describing a special group. Very quickly, when Jesus came the first time, He called a special group that followed Him in a special way of 12, and their job was to prepare the world for Christ's first coming. They especially spoke to the lost sheep of the house of Israel. Jesus said, "Do not go into the way of gentiles," until three and a half years after His death, "Go first to the lost sheep of the house of Israel." You have 12 apostles to go to a smaller group. Before He comes a second time, He's got 12 times 12,000, the 144,000 have a special relationship like the apostles with Jesus, that's my argument. I got more about it, but I'll let you jump in. Well, just to add a little bit to that. Often associated with the 144,000 is a worldwide proclamation of a message. Revelation Chapter 14, we find the three angels' messages, they got every nation, kindred, tongue, and people. Well, just before you read the three angels' messages in Revelation Chapter 14 beginning verse 6, the first five verses, if you have your Bibles, you can look at it, Revelation 14. It talks about a group of people, and it's the 144,000. This group of people in a special way take the three angels' messages in the last days to the whole world. If you look in Revelation 14:1, it says, "Then I looked, and behold a Lamb standing on Mount Zion, and with Him one hundred and forty-four thousand," same group that we read about in Revelation 7, "Having the Father's name written on their foreheads." Well, that gives us a clue as to what the seal of God contains. It contains the name of the Father or the character of the Father revealed in obedience to His commandments, that's where the Sabbath plays a part. Then it talks on about a great voice, and that was singing and so on. Then it gives you some added descriptions. Verse 3, "They sang as it were a new song before the throne, before the four living creatures and the elders, no one could learn that song except 144,000, they were redeemed from the earth." So it gives you the idea that this group of people, they were alive when Jesus comes. They're redeemed or taken from the earth, and that it describes their faith, and their purity, and their steadfast obedience to God, then you have the three angels' messages. So it's interesting to note that 144,000 are connected with the proclamation of the three angels' messages. Amen. Just a... Whenever you want to understand a number or something in Revelation, where do you go? Old Testament. I've been saying this every week. Why 144,000? If you look in 1 Chronicles 25:7, it talks about a special group that is trained in music in the worship of the temple. "The number of them along with their brothers who were trained in singing to the Lord were skillful was 288." What's half of 288? A hundred and forty-four. All right, that's in the worship. Now go in 1 Chronicles 27:15, it tells about... You have to be very patient as you read through these groups of 12 with 12,000 soldiers. "The twelfth captain for the twelfth month was Heldai the Netophathite, of Othniel, in his division were twenty-four thousand." So you got 24,000 times 12 is 288. What's half of 288? So you get 288,000 men. The Jews used to divide their year in two parts, they had the spring festivals and the fall festivals. You had 144,000 for half the year, and 144,000 for the other half the year. So if you're a Jew and you hear the number 144,000, you're not shocked by that. Those were the divisions of those who lead in worship and war in the Old Testament. Those numbers were very common. Anyway, there's more about that. Let me just give you some other things we can think about when we're talking about the 144,000. It says that... Pastor Ross was reading in Revelation 14, you get a few more clues. It says, "These are the ones who follow the Lamb wherever He goes." What do we find as we learn about the 144,000? You look in Revelation 14:4, that's where it says, "They follow the Lamb wherever He goes." Look in Matthew, someone's going to read Matthew 4:19. I'll have you read that, but before you read it, I'm going to read 1 John 1:40, "Then one of the two heard John speak, and followed him." It was Andrew, Simon Peter's brother. You go to John 1:43, "The following day Jesus wanted to go to Galilee, and He found Philip, and He said, 'Follow Me.' Jesus walks to Matthew Levi, He says, 'Follow Me.'" All right, go ahead and read your verse for us. Matthew 4:19, 20. "Then He said to them, 'Follow me, and I'll make you fishers of men.' They immediately left their nets and followed Him.'" So it's talking about a special group that... Did all of the disciples and multitude follow Jesus through all of His teaching? No, but were there 12 that followed Him all the time. When He was sleeping in the olive trees, they were there. When He was hanging out at house of Martha and Lazarus, they were there. The apostles were the ones who followed Him wherever He went, and that's why I think the 144,000. It says, "They are without guile." Who knows what guile means? It means honesty. They're not without, guile is deceit, they are without guile, they are honest. What did Jesus say to one of the apostles named Nathaniel? Behold, an Israelite in whom there is no guile is honest." It says, they sing a song. Did Jesus sing at any time, does it ever record that Jesus sang? One time, at The Last Supper, after they ate The Last Supper with the 12. Well, Judas had left at this point, they sang. He sang a song just with them. And so, and, of course, it's related to the song of Moses and the Lamb. Shall we go ahead and read the part about the big multitude. We may have more to say about the 144,000 because they're connected and that starts with verse 9, I think. So Revelation 7:9, after describing 144,000, then John writes, "After these things I looked, and behold, a great multitude which no one could number, of all nations, tribes, people, tongues, standing before the throne and before the Lamb, clothed with white robes, and palm branches in their hands, and crying out with a loud voice, saying, 'Salvation belongs to our God who sits upon the throne, and to the Lamb!' And the angels stood around the throne and the elders and the four living creatures, and they fell on their faces before the throne and they worshiped God, saying, 'Amen! Blessing and glory and wisdom, and thanksgiving and honor and power and might, be to our God forever and ever.'" Did you count all of those blessings that are pronounced upon God? Seven-fold blessing right there. Do you want to stop there? Well, you know, we almost need to read on 'cause then John asks who are these? Verse 13 says, "Then one of the elders answered, saying to me," John in vision, "Who are these arrayed in white robes, where did they come from?' And I said to him, 'Sir, you know.'" That's a good answer if you don't know the answer. So you know. "So he said to me, 'These are the ones who have come out of great tribulation, and have washed their robes and made them white in the blood of the Lamb. Therefore they are before the throne of God, and serve Him day and night in His temple. And He who sits on the throne will dwell amongst them. They shall neither hunger anymore nor thirst anymore, the sun shall not strike them, nor any heat, for the Lamb who is in the midst of the throne shall shepherd them and lead them to living fountains of waters. And God will wipe away every tear from their eye.'" Wow. Do you know how much is in this one little passage here, it's talking about the last chapters of Revelation, God will dwell with them, He'll wipe away every tear from their eyes, you'll find in Revelation 21. They're in His temple, they serve Him day and night, says they'll never hungry anymore, it says He's going to feed them, they'll sit down and sup with Him. It says, the sun will not strike them. You remember, when the children of Israel went through the wilderness, God gave them a pillar of cloud to protect them from being smitten by the sun by day. All the promises of God to His people are sort of encompassed in this passage. And some of the most beautiful praise, blessings are uttered by this great multitude, and I'm sure the 144,000. So it says these are the ones that came out of tribulation. When is the greatest tribulation? You go to Daniel Chapter 12, "At that time Michael will stand up, the great prince, that stands for the children of My people, and there will be a time of trouble such as there never has been since there was a nation even unto the same time." Jesus quotes that in Matthew 24, and at that time that people will be delivered. Some have wondered if the 144,000 is a special group that is called and filled with the Spirit in the last phase of the church. Some of them may have already passed away. They do the work where they specially follow the Lord. They have the special relationship and calling of proclamation, and they're preparing the world for the second coming. As a result of their ministry, a great multitude is converted which gives us hope, that means it's not just 144,000 that will be saved, but there's many others saved beyond that group. And... But it also may, you know, be pointing to the saved of all ages because not only was there a, you know, when Jesus in Matthew 24 says, there's a great time of trouble, He's actually identifying three times of trouble. You've heard a dual prophecy? That's a triple prophecy. Jesus talking about a time of trouble that came on the Jewish nation in A.D. 70, right? In Matthew 24, He's talking about the time of trouble of the Dark Ages from 538 to 1798. And I'm sure, He's also alluding to the great time of trouble before He that endures to the end will be saved, when He sends His angels and they gather together His elect. Something else interesting to note about the great multitude where you have the description given in verse 9, that says, "And these come from every nation, kindred tongue, people." It's interesting to note that the first angel's message in Revelation 14 is a message that goes to every nation, kindred, tongue, and people. Here we see the results of the evangelistic work that's done in taking the gospel to the whole world. The result of that is a great multitude that no one can number standing before the throne of God. This is the redeemed. As Pastor Doug mentioned, not only is it limited to those who are alive when Jesus comes, but it can refer to all the redeemed throughout ages who have been resurrected when Jesus comes the second time. So just this final glorious gathering in heaven before the throne of God, praising Him for salvation. Now, how many of you want to be one of the 144,000? You think you do. You want to be at least part of the great multitude? You might be thinking, "Well, I can't be one of the 144,000, I'm not Jewish enough." And it says they're from the 12 tribes. Let me just remind you of some verses on that subject. In Galatians 3:29, "If you are Christ, then you are Abraham's seed and heirs according to the promise." You can look in Romans 2:29, "For he is not a Jew who is one outwardly nor a circumcision that which is outward in the flesh, but he is a Jew who is one inwardly." And go to Romans 9:6, "But it is not the word of God has taken no effect. For they are not all Israel who are of Israel." There's a lot of spiritual Jews. Did Rahab become a Jew? Is she in Jesus' family tree? Did Ruth become a Jew? And Tamar, matter of fact, when you look in Matthew Chapter 1, one thing you learn from looking at the genealogy of Jesus is there were some other people that somehow got into His family tree. Couple more verses. Jesus said to the Jews, "Do not think to say..." I think it is John the Baptist, "Do not think to say to yourselves, we have Abraham as our father, for I say to you that God is able to raise up children to Abraham from these stones." In fact, as the gospel went to the Gentiles, the Gentiles that accepted Jesus were grafted into the stock of Israel, and they become at least spiritual Jews. So whosoever will now can take claim to all the promises made to Abraham and become at least the spiritual Jew, you could be one of the 144,000. Something else to add about this group of people, I always find it interesting in verse. Oh, I think it's 16 verse of Chapter 7, talking about this group. It says, "They won't hunger anymore, neither thirst anymore, the sun shall not strike them nor any heat." That's interesting why specifically it talks about this intense heat. It's interesting to note that one of the last plagues, one of the seven plagues that come is intense heat just before Jesus comes. So here is a group of people that quite possibly are alive when Jesus comes, they've been faithful. Now God takes care of His people, even when the plagues come, He protects them. It doesn't mean that you won't experience any of the heat in one of the place. But here when Jesus comes, they are delivered from that, they are rescued, they are saved through this time of trouble. Sometimes people ask us, we have called in the radio program, "Are the righteous saved before the time of trouble or they're saved after the time of trouble?" If you look in the Bible at God's people at the time of trouble, often you find them going through the time of trouble, but God sustains them, protects them, and brings them out like Shadrach, Meshach, and Abednego. They went through the fiery furnace, but God brought them out. Daniel went through the lion's den, but God brought them out. So God's people in the last days, they are here on the earth. When probation closes and the place begin to fall, God protects them, sustains them, and brings them out. And that's the promise that we have there in Revelation Chapter 7. The great time of trouble is the seven last plagues. That's the wrath of God being poured out. Were the children of Israel in Egypt when the ten plagues fell on Egypt? They were. In other words, some people wonder why ten plagues in Egypt, why seven in Revelation? And we got another lesson coming on that. It's interesting. The children of Israel suffered with the Egyptians for the first three plagues, but they were protected through the last seven of those ten. Isn't that interesting? But He saved them through the plagues, and God will save us through that final time. Now something that comes up when you're studying the 144,000, as Pastor Ross mentioned, they reappear in Chapter 14 of Revelation. It says, they have special white robes, a great multitude is clothed in white robes. What do the robes represent? Revelation 3, let the Bible explain itself, verse 5, "He that overcomes the same will be clothed in white raiment, and I will not blot his name out of the book of life." Revelation 19:8, "And to her was granted that she should be arrayed in fine linen, clean and white, for the fine linen is the righteousness of saints." It means that they've got this righteousness. And then there's one other interesting statement it makes, it says, "A hundred and forty-four thousand are virgins." And I actually know churches that teach that God's people in the last days should practice celibacy and not get married because of that verse. Is that what that's talking about? That'd be a problem. First of all, because that word virgin there, it's feminine in the Greek. Why would it say that regarding these 12 tribes? It has nothing to do with abstaining from marriage, or anything wrong with marriage, or intimacy in marriage. They should be pure morally, but are there women in Revelation 17, Babylon and her daughters that are impure, they are defiled with false teachings. The 144,000 are virgins, in that they are not defiled with the false teachings of Babylon. You know, it's always amazing to me that you have people like Rahab, and Tamar, and Mary Magdalene that were women that had bad reputations, but they become respected saints through Christ, they become pure. And so the 144,000 are like that. You'll also find a description of 144,000 in Revelation 14, it says, "In their mouth was found no deceit, for they're without fault before the throne of God." We might wonder, "Well, that seems to exclude us, for all have sinned and come short of the glory of God." No, if you read it there in the Greek, it says, they were found without fault before the throne of God. Just talking about a specific moment in time, it doesn't mean they've never sinned, but it means they've come to God in genuine repentance, they have been forgiven, their sins have been blotted out, they are found righteous before God without any fault, meaning Christ has paid for our sins. Our past is gone, we stand pure and holy before God. That's encouraging. Every one of us, by God's grace can be faithful right up till the very end. Yeah, and they're declared righteous in that judgment. And something else you learn about them is there is a special sequence. It says in verse 4, Chapter 14 of Revelation, still talking about the 144,000. I don't know what we're going to do when we finally get to Chapter 14, we've taught it all now. Well, it all goes together, who are the 144,000? It says, "These were redeemed from among men being the firstfruits to God and the Lamb." Who were the first followers of Jesus? Wasn't that the 12... Right after His baptism, the 12 apostles began to gather around Him. And again, they're some of the first that stepped forward, and they come to follow Jesus, and they become disciples. So I see the 144,000 is sort of a last day example of doing a work of apostles in proclamation. They've got a special relationship with the Lord. And are they the only ones that received the Holy Spirit? At Pentecost, when the Holy Spirit's poured out, Acts Chapter 2, who is in the upper room? Twelve apostles, and who else? Hundred and twenty, total. It's 10 times more than just the 12. So a great multitude is then filled with the Holy Spirit, and how many are baptized that day? Three thousand, the first time, five thousand later, right? Under the influence of those that were filled with the Holy Spirit. So it's not just the 144,000 that are filled with the Holy Spirit in the last days. And so are we going to see people going around in the last days wearing tags like marathon runners wearing numbers and they'll say, "I'm number 142,000 of the 144,000." I don't know that they'll even know that they are, but God's going to know who they are. I think we should be rather leery of somebody who's boasting that they are part of 144,000. It almost gives the impression that they think they're better than anyone else or everyone else. No, God's the one who knows. We want to be faithful to Him and allow Him to use us in whatever ways He deems fit, right? Oh, Lord, if You want me to preach to the world, I'll preach to the world. If You want me to preach to my family, I'll preach to my family, whatever it is You want me to do, I want to be faithful to You. Amen. I think one of the most important things we can learn from the 144,000, it says, "They follow the Lamb wherever He goes." That means when He goes to the cross, what does Jesus say? "Whoever would come after Me, He would follow Me, and must deny yourself daily, take up your cross, and follow Me." Did many of the disciples lay down their… The apostles lay down their lives? Of the 11, Judas took his own life, but ten of the others, according to history, we don't know every detail, but according to what we know from history, and some of it is from, you know, legends, you might even say. They all sacrificed their lives. John is the only one who died of old age, and they tried to kill him, they put him in boiling oil. So they were willing to follow their lives. They counted not their lives dear unto them, but they were willing to lay down their lives. What's different about the 144,000 is I think that God preserves them just as He did to the Apostle John, and they survive the final onslaught of the devil in the last days. Any closing thoughts? You know, if we're going to follow the Lamb throughout the vastness of the universe after Jesus comes, we need to start following the Lamb right now. And we can follow the Lamb in our own private lives, in our hearts, in our families, in the church, we can make that commitment to follow the Lamb wherever He goes. Amen. Well, that was fun. I just... For those who are watching, I didn't give Pastor Ross any warning, I just asked him to come up and teach with me. He did pretty good, don't you think? I knew he knew this. I figured we had matching suits today, we could teach together. We might do this again sometime, that was fun. For our friends who are watching, don't forget, we do have a book that really goes into more detail of the very thing we're talking about, and it's called Who Will Sing the Song? Really who are the 144,000? You want a free copy, all you have to do is call 866-788-3966, that's 866-Study-More, and ask for offer number 172. You can actually go to download it right now, all you have to do is text. Here's what you do. You text, "SH119" and you text that to 40544, and you'll be able to download a copy of this right now and read it for yourself. Thank you so much for studying with us. God willing, we'll continue to study the Book of Revelation next week. Don't forget to request today's life changing free resource. Not only can you receive this free gift in the mail, you can download a digital copy straight to your computer or mobile device. To get your digital copy of today's free gift, simply text the keyword on your screen to 40544 or visit the web address shown on your screen. And be sure to select that digital download option on the request page. It's now easier than ever for you to study God's Word with Amazing Facts wherever and whenever you want, and most important to share it with others. If you wish, you could get a new start. I'd like to live my life over knowing what I know now, I don't want to start over and just make all the same mistakes. I want to have my memories, so I don't make the same mistakes. But you do get a new beginning, you become a new creature, that feeling of all your sins being washed away because God promises it. Isn't that wonderful concept? "I was thirsty, and you gave me drink. In as much as you did it to one of the least of these, My brethren, you did it to me." My parents got divorced when I was three or four, and then, I was basically unchurched most of my life. I had a girlfriend in high school telling me that she had to break up with me because I wasn't a Christian. I thought that's weird, I believe in God, why would she say that? Not realizing I was living a horrible life with foul language, was mean, and other stuff. And that kind of challenged me initially, and then my dad, 9/11 woke him up. I think he wasn't ready to meet his Lord though he was a man that I valued and knew he loved me, didn't doubt that. But he just knew he needed more. So he started watching TV ministries first. Baptist preachers, and others, and he was kind of intrigued by what he was learning, and so when he turned me on to this television station, first thing that I got access to was Doug Batchelor's Most Amazing Prophecy series that he did in Berrien Springs, Michigan. And I remember when I first watched this, my background was Baptistish of sorts, but I remember when I first watched the series, I remember thinking I've never heard that before about the State of the Dead, or about the Sabbath, or the Commandments, or the Rapture, other things. I remember thinking to myself, I've never heard that before, but that's what the text says, and that kept happening, and I had this experience of just wondering like, "Well, what else have I believed that isn't as it is, you know?" And the more I watched, the more helpful it became. But again, he kind of took a different perspective on the messages. It was fresh to me, but I just... These things I had never heard before, and I just realized like, "There's so much stuff in the Bible that no one's talking about and that people need to know." And so I ended up in this awkward situation that some of my friends who didn't believe what I was coming to believe, I didn't know how to communicate with them, and so one of the things that helped me initially was the sabbathtruth.com website, thetruthabouthell.com, and the truth about death. And some of those resource websites that Amazing Facts had put together, that were just full of resources. If I needed an answer to something that someone brought up, there would be a 95% chance that Amazing Facts would have something that I could use. It makes witnessing even easier in that sense. The Amazing Facts Prophecy Study Bible was my first real Bible that I had of a more trusted translation. The Bible study guides were on the back of it and lot of other resources that were helpful. If you can hand a book to somebody and you can pick up a phone and call Amazing Facts, you have everything you need. And so I was just printing off stuff and handing it to people, you know, like, here's what I'm coming to realize, this is true, it's in the Bible. And it was a huge blessing to me, and a real help just to kind of help me to better understand what the message was, and understand it for myself, and have resources to put in the hands of the other people, it was invaluable. Some time went by, I eventually went to school of evangelism, and was baptized. And then I had this amazing opportunity that after being in the ministry for about five or six years, Doug Batchelor was going to be the main speaker at youth events, and I was actually going to be doing a seminar at this youth event. And it was just this amazing kind of full circle experience that the first person that I came in contact within Adventism, to hear the message to have it make sense, to be able to do ministry together with him in whatever role possible just meant the world to me, and to be able to tell him my story and tell him thank you was invaluable. And so God just gave me a precious gift and afforded an opportunity and I'll never forget that. My name is Dee. Thank you for changing my life. Port Royal, here in Jamaica was once considered the most wicked city in the world. They had more bars and brothels per square foot than any other place on the planet. It was said to be full of cutthroats and pirates. But during this time, the king of France, Louis XIV, he began to persecute the Protestants and the Huguenots in the kingdom and many fled. That's when Lewis Galdy and his brother Laurent came to Port Royal. When Lewis Galdy arrived, he was absolutely dumbfounded at the unrestrained immorality, violence, and extravagance that filled Port Royal. That's why nobody was surprised when the judgment of God finally happened. Just before noon, in June 7, 1692, there was a massive earthquake that affected the whole island, Port Royal in particular. Two-thirds of it slid into the sea. Then came a tsunami, thousands perished. Unfortunately, even Lewis Galdy was swallowed up in the earthquake. You know, much of Jamaica is a rock. But Port Royal was built on the sand. And so when the earthquake struck, the sand virtually liquified, swallowing much of the city and thousands of people. Lewis Galdy was buried alive. But while underground, he was still conscious and he prayed. He was lying himself to his fate, prayed to the Lord, and then another miracle happened. There was an aftershock with volcanic activity that exploded blowing Lewis Galdy out of the earth, hundreds of yards off into the sea where he had a very pretty hard landing, but he was able to swim until he was rescued. Lewis Galdy dedicated the remaining 47 years of his life to serving Jesus in this island, and he's even buried here still today. You know, the Bible tells us, just before Jesus comes back, conditions in the world will be very much like they were in Sodom and Port Royal. There is going to be a tremendous earthquake and even islands will be swallowed up. But God's people don't need to be afraid. The same way that the Lord took care of Lewis Galdy, He will take care of you. It says in Psalm 91, "That you might see a thousand fall at your side or 10,000 at your right hand, but only with your eyes will you see and behold the destruction of the wicked." He can protect you and resurrect you.